The First European Jewish Community Leaders’ Survey 2008 explored a host of issues informing the perspectives and policies of Jewish leaders across Europe—from the debates over conversion and integrating interfaith families, to the scope and quality of programs for various target populations and the prospects for a new generation of leadership. It also investigated how and to what extent antisemitism, migration, European integration and events in Israel are shaping current and future communal priorities. The result is a multi-dimensional, leader-driven portrait of Jewish Europe today, drawn from a variety of institutional, generational, ideological and regional perspectives. The report contains valuable insight into the agendas and concerns of both established and emerging decision-makers and opinion-shapers as they look ahead to the second decade of the 21st century. 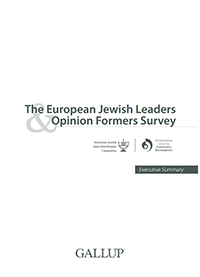 The First European Jewish Community Leaders’ Survey collected data from over 250 individuals in 31 countries.